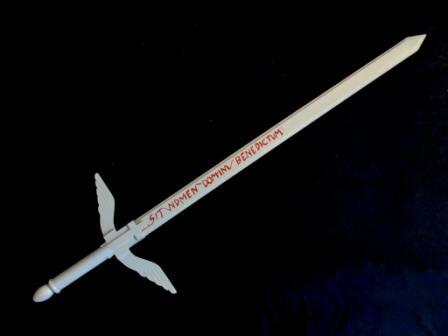 Both sword and sheath are made of wood with plastic details. This sword belonged to the character Ashitaka. Wood sheath. Measures approximately 4 feet long. Features woven string style handgrip and detail carved on hand guard. Measures 4 feet long. Features cloth wrapped handgrip. This massive sword measures approximately 5 feet in length. Features leather wrapped handgrip. Made of wood with aluminum chain end. Measures approximately 4 feet long and features a canvas wrapped handgrip. Measures an enormous 6 feet long (3 foot blade). Features a canvas wrapped handgrip. Measure approximately 4.5 feet long and features a partial leather wrapped handgrip. 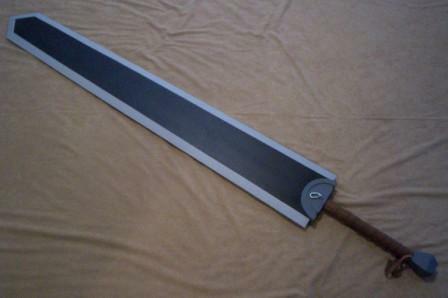 This massive weapon is carried by the character, Guts, in the anime Berserk. With a leather wrapped grip, this sword measures nearly 6 feet long! From the anime, Le Chevalier D'Eon. 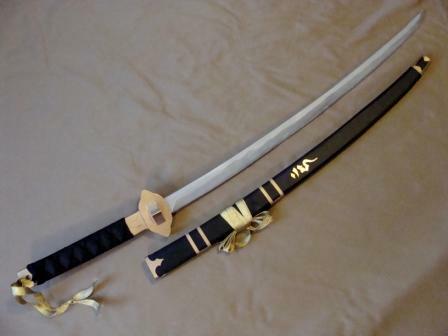 This sword is from the anime/manga/game. Vinyl sheath.